This is my first @engrave blog post, I hope I have done the new project justice. Comments please, any help, tips or criticisms are welcome as I feel my way around. Well done to the @engrave create and designers, good job. All the turtle species of the world are considered endangered and 6 of these species can be found in Indonesian waters. The species are the Green Turtle, Hawksbill, Leatherback, Loggerhead, Flatback & Olive Ridley varieties Source: “http://www.baliturtles.com” Since 2016 thousands of turtles have been saved and released back into the ocean by the dedicated family at Suraberata Turtle Conservation Farm. In August 2018 I visited Suraberata, a Balinese Turtle Conservation Farm for the 2nd time. The first visit was in 2016, shortly after the turtle project was started. It was wonderful this August, to see how it had developed, grown in popularity amongst tourists and how much the 2 resident turtles had grown. (One has since been released) During my visit the turtle pools were upgraded with white tiles. The turtles love their new temporary home. My friends Gede and his wife Rada Krishna established the farm on their property and built pools for the baby turtles at the end of their garden close to the house. The eggs are either donated or purchased from locals who collect them to sell to local restaurants as a delicacy, so Gede buys them at a higher price and keeps them buried in a hatching sandpit until they are ready to emerge. Each batch is marked with the date so he can calculate when they are ready to hatch. After hatching they are kept in a salt water pool until hey grow big enough to have a better chance of survival. In the wild they enter the ocean at one day old and have a slim chance of survival due to predators especially sea gulls and other birds. The larger older baby turtles are stronger and are released under supervision to ensure they reach the ocean safely. The Turtle farm is funded by generous donations from visiting tourists and website visitors. There is a donation portal on their website, which I built for them in 2016, which was my donation to the farm. 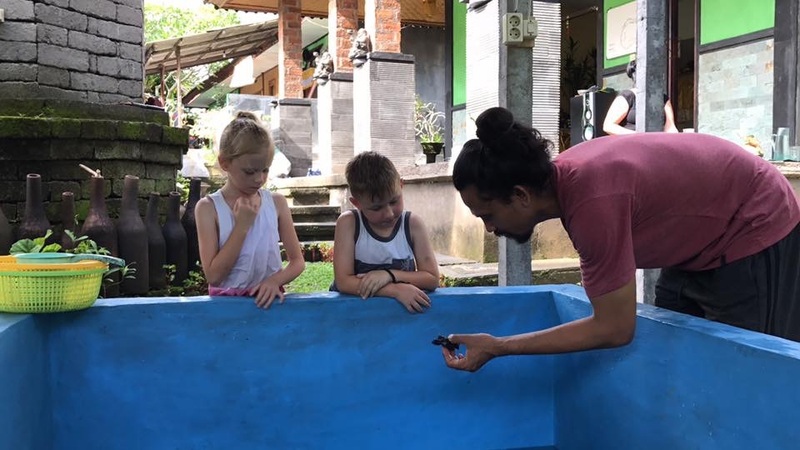 Gede and his wife also do guided turtle farm tours for groups and families, explaining the hatching and feeding routine. They keep one large tame 18 month old turtle, so children can experience handling a turtle. Turtle release ceremonies are arranged for tourists who make a donation and then recieve a baby turtle to name and release. 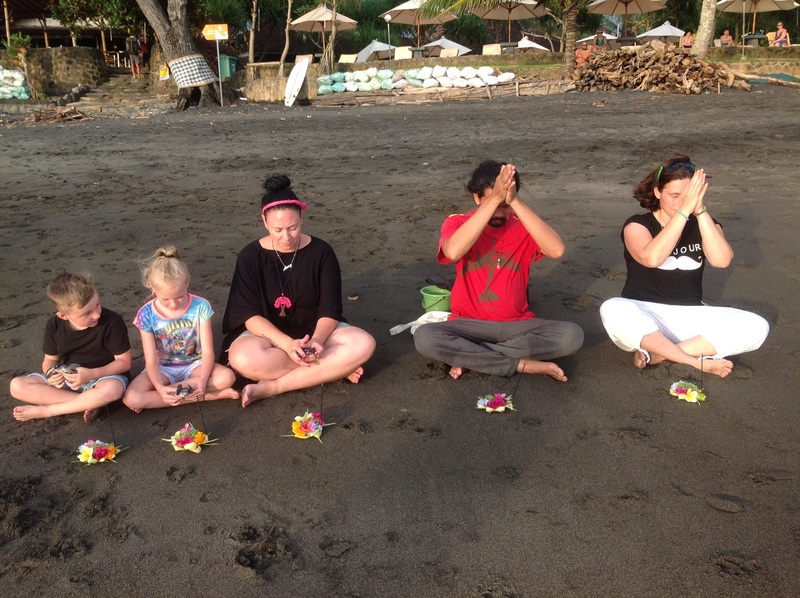 A group will typically gather on the beach usually in the late afternoon or early morning to take part in a ceremony which includes Hindu offerings and prayers. After the ceremony the baby turtles are set on the sand. The turtles have a perfect sense of direction walking straight into the surf and then swimming out to sea. Using binolculars you can see the baby turtle coming up for air, as it swims out to sea for quite some distance. A signed laminated certificate is presented to every person that releases a turtle or visits the farm.